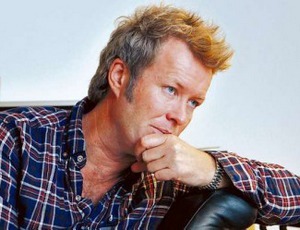 Magne appeared at the annual HOPE-Gala in Dresden, Germany on Saturday night. He was there together with The Voice winner Martin Halla, who performed at the event. Money raised at the HOPE-Gala will help benefit the fight against aids in South Africa. Martin Halla also performed at the opening of Magne’s Bouquet exhibition on Thursday, which can be seen in this video clip. VG’s art critic Lars Elton gave the Bouquet exhibition a good review (5 out of 6) in Friday’s newspaper. 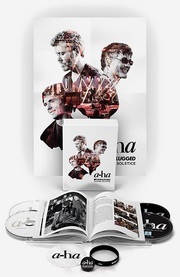 “Magne Furuholmen has proven that he’s more than capable as a visual artist. This [retrospective] exhibition shows that he’s been so for a long time”, Elton writes. Magne’s massive outdoor installation Bouquet was officially unveiled in Asker yesterday, in connection with the opening of group exhibition “Kunst Rett Vest”. “Although this is more of a cover-up than an unveiling”, Magne joked. 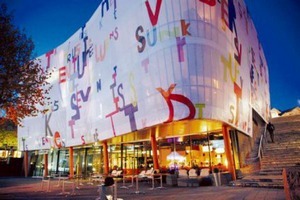 By using a gigantic nylon sheet, Magne has completely covered a building called Torvgården and decorated it with tulip-coloured anagrams using the letters in “Kunst Rett Vest”. This particular building is often referred to as the Aalto Vase because of its characteristic shape – a vase which is often used for tulips. “I used the connections to the tulip vase as a basis, which in turn inspired the title and colour pallette. 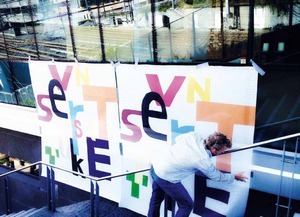 And then I’ve just used the letters in “Kunst Rett Vest” and made different anagrams. I’m not the one to judge the result, but I hope it freshens up the place a bit”, Magne told Budstikka. Update: Magne’s upcoming anniversary exhibition at Galleri Trafo will apparently also be called Bouquet, according to an update from the Magne F mailing list. The exhibition is open from October 25th – November 25th.